Alfred Lewis Enoch (born 2 December 1988) is an English actor, best known for playing Dean Thomas in the Harry Potter film series and Wes Gibbins in the ABC legal drama television series How to Get Away with Murder. Enoch was born in Westminster, London, to English actor William Russell and his second wife, Etheline Margareth Lewis , a Brazilian-born doctor of Barbadian origin. He attended Westminster School, a public school in London. In 2001 he was cast as Dean Thomas in Harry Potter and the Philosopher's Stone. He appeared in seven of the eight Harry Potter films. He also voiced the character in video games. He is fluent in Portuguese, and graduated with a degree in Portuguese and Spanish from The Queen's College, Oxford. After the Harry Potter films, Enoch appeared in a number of plays throughout London including Coriolanus, Timon of Athens, Antigone, Happy New Year, and The Ballard of Salomon Pavey. He played Bainbridge, the Bloody Guardsman, in the Sherlock episode, "The Sign of Three". In July 2011, Enoch appeared at the London Film and Comic Con. In 2014, Enoch was cast in the series regular role of Wes Gibbins in the ABC legal drama series, How to Get Away with Murder produced by Shonda Rhimes. In 2016, Enoch was cast as Edgar/Poor Tom in the well received Talawa Theatre Company and Manchester Royal Exchange co-production of King Lear, for which he won much praise for his characterisation and the physicality he brought to the roles. Enoch returned to the West End in the 2018 revival of Red at Wyndham's Theatre, starring alongside Alfred Molina. 2013 Broadchurch Sam Taylor Episode: "1.1"
2013 Mount Pleasant Alex Episode: "3.7"
2014 Sherlock Bainbridge Episode: "The Sign of Three"
^ Index of Births, Marriages and Deaths in England and Wales, 1984–2005. 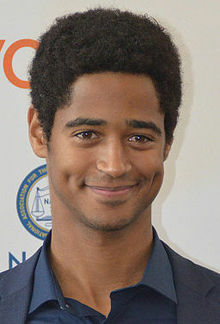 ^ "What Harry Potter's Alfred Enoch got up to next". Evening Standard. Retrieved 2018-10-11. ^ Gayle Macdonald (14 July 2011). "Matthew Lewis grew up at Hogwarts with Harry and the gang". The Globe and Mail. Retrieved 25 October 2014. ^ "Alfred Enoch". scarpotter.com. Archived from the original on 6 September 2017. ^ a b "Coriolanus". Donmar Warehouse. Archived from the original on 12 November 2014. Retrieved 13 November 2014. ^ a b Mason, Paul (20 July 2012). "Timon of Athens: The Power of Money". The Guardian. Retrieved 13 November 2014. ^ "Alfred Enoch". ABC. Disney–ABC Television Group (Disney Media Networks). 24 July 2014. Archived from the original on 28 July 2014. Retrieved 24 July 2014. ^ Andreeva, Nellie (8 May 2014). "ABC New Series Pickups: 'Selfie', 'Forever', Galavant', 'Whispers', 'How To Get Away With Murder', 'American Crime', 'Black-ish', Jeff Lowell Comedy". Deadline.com. Retrieved 12 May 2014. ^ Greco, Patty (2 October 2014). ""How to Get Away With Murder" Star Alfred Enoch on Abandoning His British Accent, Emma Watson, and "Legally Blonde" "That should have been my research."". Cosmopolitan. Hearst Corporation. Retrieved 13 November 2014. ^ "King Lear Reviewed". talawa.com. ^ "Don Warrington's King Lear is a heartbreaking tour de force". The Daily Telegraph. ^ "King Lear review at Royal Exchange Theatre, Manchester". thestage.co.uk. ^ "Theatre review: King Lear at Royal Exchange Theatre". britishtheatreguide.info. ^ Michael Billington. "Red review – Alfred Molina's portrait is as layered as a Rothko canvas". The Guardian. Retrieved 6 June 2018. ^ Patrícia Kogut. "Alfred Enoch starts his first Brazilian film directed by Lázaro Ramos". O Globo. Retrieved 14 April 2019. Wikimedia Commons has media related to Alfred Enoch. This page was last edited on 17 April 2019, at 14:18 (UTC).